Betrayal at Kronor is based on Raymond E. Feist's Riftwar Saga, a medieval fantasy role playing game, set in the Riftwar universe. Developed by Dynamix, and published by Sierra On-Line in 1993. The game's story is split up into 9 chapters which each has a goal that needs to be achieved before progressing to the next one. You do have a fair amount of freedom to explore each chapter with many side quests available. Betrayal at Krondor starts with Gorath, Locklear and Owyn are the first party characters however others may join/leave as the story evolves. As the story begins, Owyn, is tending Seigneur Locklear's wounds. An Assassin enters the camp and Gorath suddenly shouts. Gorath kills the assassin and the adventure begins. Take the Assassins lock picks and rations by clicking on his corpse. A dialogue will start after a few steps. Locklear will unlock Gorath's chains and make Owyn come along to prevent him from talking. The easiest way is to head south. Beside the path you will see a 'Moredhel' box. Gorath translates the inscription however you have to answer the riddle to open the box. Turn the dials to read DIE for the box to open. Inside you will find a sword and some Armour. Head South and Squire Philip will approach. Owyn will talk to him for a while and then you will be able to ask questions about the area. Continue South and enter LaMut. You can buy/sell equipment in the shop and rest at the inn. If you go to the barracks, you will be told about a stolen ruby. (Sub quest). When you leave LaMut and continue South you will be attacked by an assassin. Click on him before the battle starts to get the initiative. Continue south past Zun. When you reach the fork in the road, continue South to take the quickest and safest route back to Krondor. Just beyond the fork in the road there is a trap. Make it to the far side of the screen without walking between any orbs of the same colour. Head South past 'Questor's View' you will find a farmer named Rowe who will offer you shelter from the coming storm. Decline his offer. Continue Southeast until you reach Sarth, Then speak to a character called Brother Marc in a field just beyond Sarth. He will offer to teach Owyn Spell casting and will tell you that his dreams have been interrupted because some spell caster is doing a dream sending. To the south is the Temple of Sung. The high priestess is suffering from a lack of sleep and none of the priests will be able to heal or bless your equipment. To the Southeast you will see Rowe's barn, click on it and you will be attacked by three 'moredhel' warriors. and a powerful 'Moredhel' spell caster. After you defeat the spell caster return to the temple and the priestess will teach Owyn a spell as thanks for defeating the spell caster. 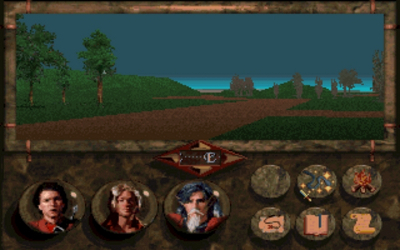 Go South past a few enemies and enter Krondor. Once you visit the palace, you will find that the gates won't open and Seigneur James is missing. Enter the sewers below the city and you will be confronted by a thief called Limm but will be allowed to pass. Head left, then North at the next fork. Shortly you will be attacked by three Nighthawks. Enter the passage North to meet a character called Seigneur James. He will give you the Royal Key of Krondor. Most of the locks at the top of the ladders are broken, but there is a good one near the top right part of the sewers. Use the Royal Key of Krondor to enter the Palace. 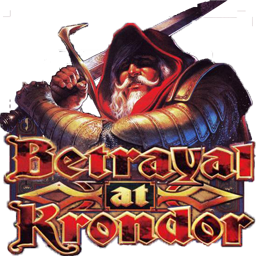 After playing the game for quite some time, off and on over the years, I can see a Betrayal at Krondor remake would definitely be something worthwhile. At least a Chapter 1 to start with to see how it went. Anyway a great game to play if you spend the time to absorb the storyline. And finally, this is a single clickable executable for the Mac I've created. It wraps everything up to make it as easy as possible to play. I'd love to see a remake - one of the best games I've played. With a game engine like Skyrim/Fallout this would be a tremendous hit.